Frazer-Nash teamed with Bombardier Transportation to scoop the prize for Technological Innovation at the Rail Business Awards for their joint work on the Train Zero project at Bombardier's Derby plant. The Rail Business Awards recognise and celebrate the best businesses in the UK rail industry and the Technological Innovation Award recognises the potential of Train Zero to make the next generation of rolling stock (destined for Crossrail) quicker to develop and more reliable while also improving performance, providing rail passengers with a significantly improved service. Crossrail will be an integral part of Transport for London's mass transit system and is set to takeon a significant amount of the passenger load across the capital, increasing London's rail capacity by 10 per cent, so it's essential that the trains delivered are as reliable as possible fromthe day services commence. "Our collaboration with Bombardier on this project has drawn on our knowledge of current best practice cross-industry and Bombardier's unrivalled experience of building great trains. 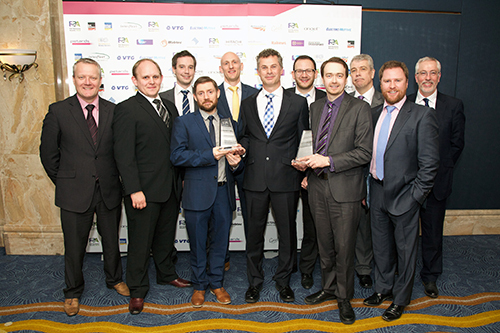 We are delighted that the Rail industry has recognised the value of the project. "Train Zero will help Bombardier create an all new train that meets Crossrail's exacting specifications and will also achieve planned reliability much earlier than has previously been the norm in the UK rail industry. "The project is also set to act as a catalyst for further innovation by Bombardier's engineers and suppliers to collaborate on integration of train systems at an early stage and that's something we hope to develop in the future"